As it is close to Easter, I thought it would be fun to do something in beautiful pastels. 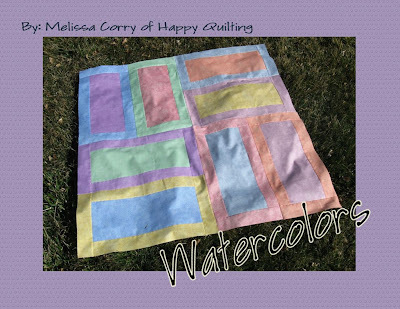 So let me introduce you to Watercolors, A simple little quilt that goes together fast and would work perfect as a table topper, wall hanging, or baby blanket. Let's get started. To begin, you will need to get 8 fat quarters. I choose to use 8 Fat quarters in pastels from the Dimples collection by Andover. (I did swap out that red one though, it was just to bright.) Now go ahead and lay out your fat quarter on your mat and cut a straight edge along the right and side and bottom of your fat quarter. 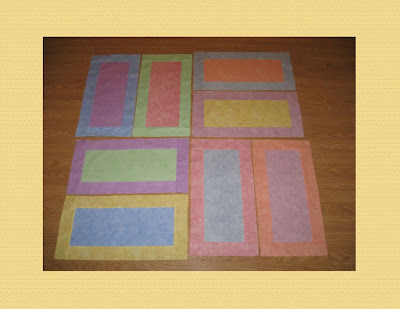 (You can also stack up your fat quarters and cut up to 4 at a time.) 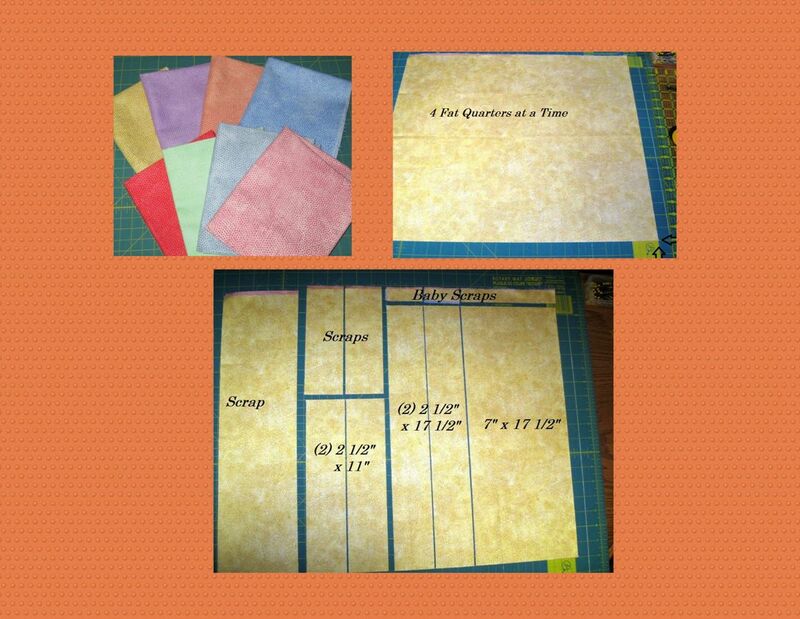 From each of your 8 fat quarter cut (1) 7" x 17 1/2" rectangle, (2) 2 1/2" x 17 1/2" strips, and (2) 2 1/2" x 11" strips. 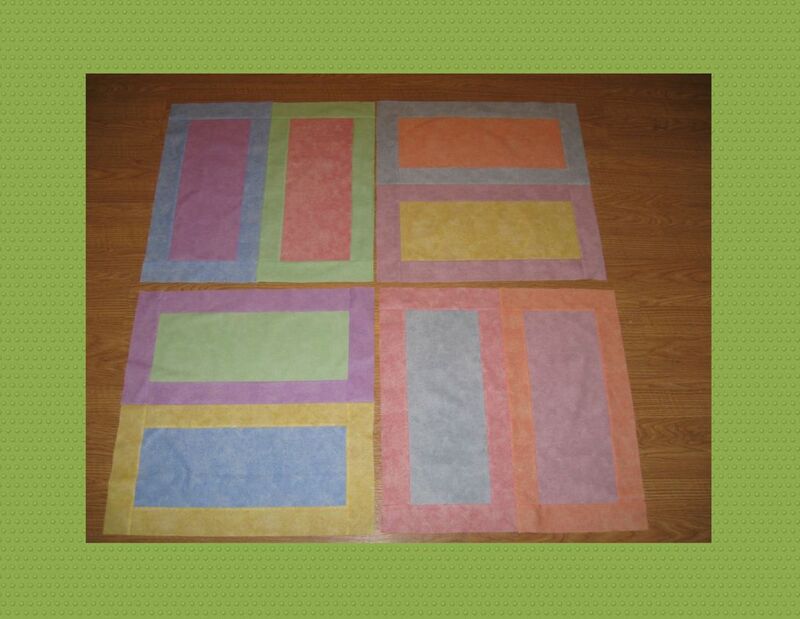 Select a 7" x 17 1/2" rectangle of one fabric and 2 2 1/2" x 17 1/2" strips in a different fabric. Lay them out as follows. With right sides together place the long strips onto your rectangles. Pin along both edges. 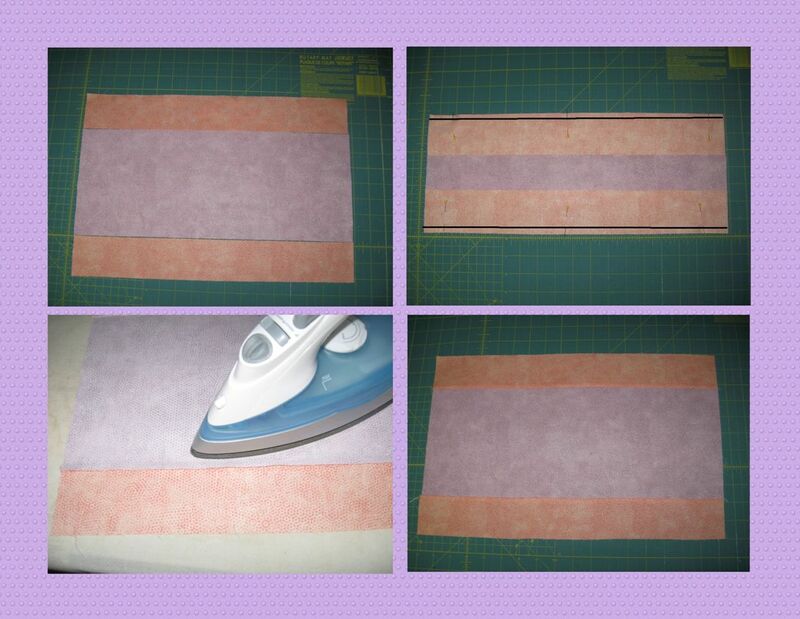 Sew a 1/4" seam along both pinned edges, and remember to remove the pins as you go :) Press towards the strips. Repeat for the 7 other sets so you have 8 pieces like the last picture. Now grab your 2 small strips that match the long strips. Lay them out as follows. 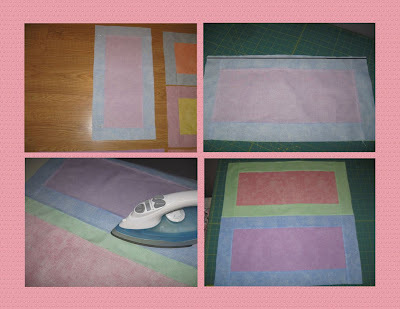 With right sides together place the short strips onto the sides of your rectangles. Pin along both edges. Sew a 1/4" seam along both pinned edges. Press towards the strips. Repeat for the 7 other sets. Now you have 8 framed squares. Now well make sets of 2. We'll start in the upper corner. 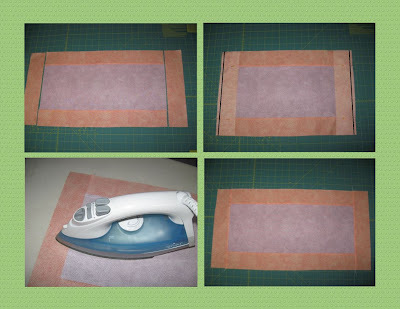 Place the first sashed rectangle onto the second with right sides together. Pin along the edges, taking care to match up the seams. Sew a 1/4" seam along the pinned edge. Press either direction or open, it really doesn't matter. Now you have a set of 2. .
Repeat the last step with the other 3 sets to make 4 sets total So your top should look a little something like this. And now you are ready to finish up your top. A few things before I sign off. What a great little project. 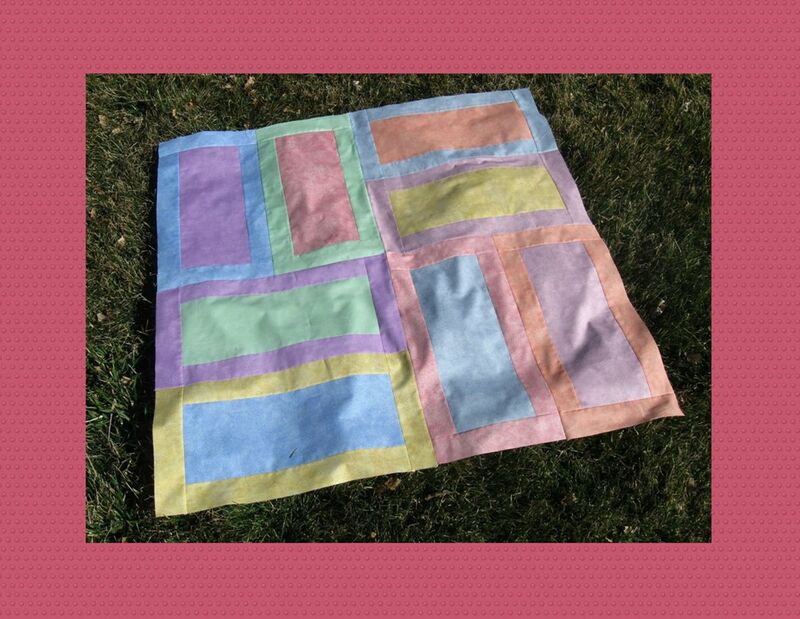 I think we all have a go-to pattern that sews up quickly for last minute gifts. I am rather tired of mine so I will consider this one to work up after the Holiday. I have a friend who needs a gift....nothing like a new baby to rev up the sewing! Thank you so much for sharing this and I am looking forward to your video presentation. Such ambition. I can't wait to see your new videos. I'm sure they will be as wonderful as all of your other projects. 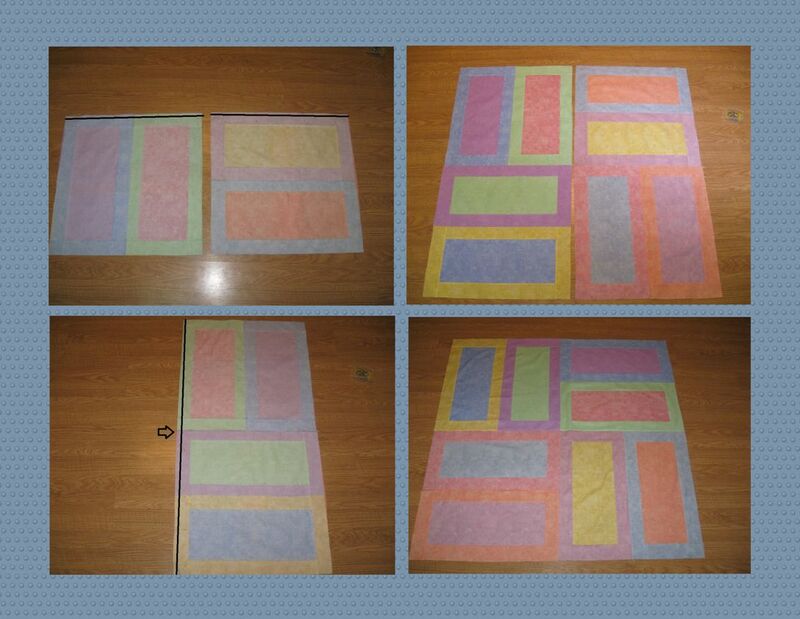 Such cute quilt! What is the finished size? I love the quilt! It's so fast, and yet so appropriate for babies or tables or most any other small quilt need. I love the fabrics you chose, too. You're using your program in ways I haven't even thought about yet!